My oligodendroglioma tumor is dispersed rather than concentrated, which is what makes it inoperable. Jinny says that the MRI pictures of the tumor remind her of a mist, or of sheep scattered over a pasture. When we think about the tumor shrinking in response to the chemotherapy, we have a particular image in mind. This image came to Jinny on the first night that I was taking the chemotherapy pills, in fact almost at the moment I was taking them. She thought of a border collie herding scattered sheep back into their pen. 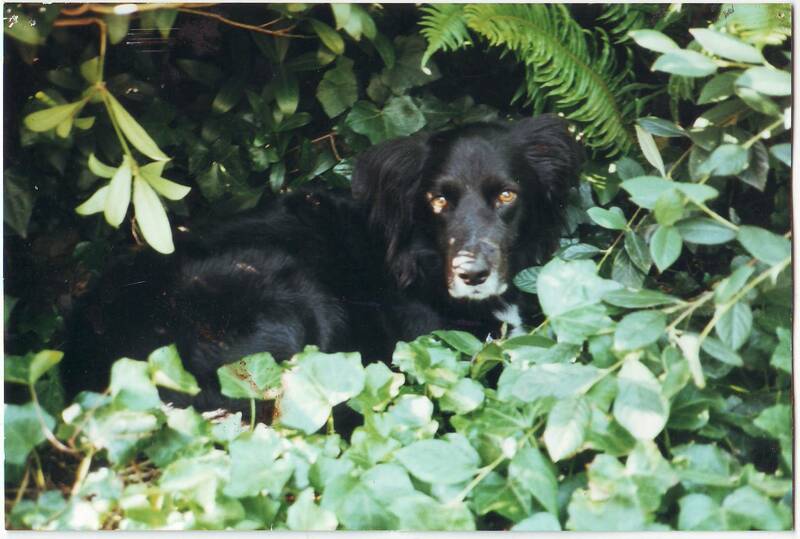 For many years our family included our dog Jake, a border collie mix, who was very bright and smart and would try to herd us down the halls of our house, bumping us with his nose to where he wanted us to go. Because of Jake we will always have a place in our hearts for border collies. 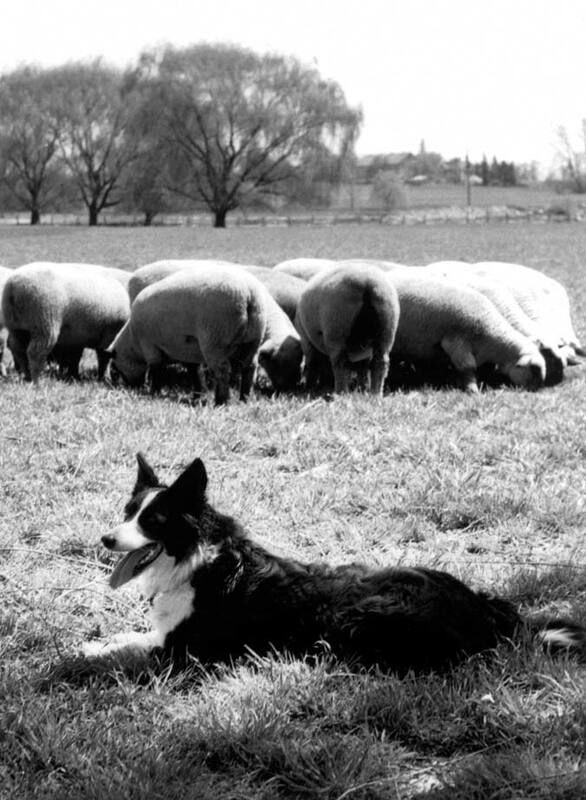 So as I was taking my first chemo pills to combat a tumor that looked like sheep scattered and wandering where they should not be, Jinny thought of a border collie sent out to round up the sheep. We like this image because it is personal to us, it is nonviolent (not blasting to smithereens those evil cancer cells), and the image implies not only sheep and a border collie, but also a shepherd or herder at whose command the border collie acts. For us, of course, the shepherd is Jesus. When Jinny told me about this image, I said I want more than one border collie. I want a whole team, working together to round up the scattered sheep and bring them back to their pen where the Good Shepherd can heal them. Within a couple of days I had named six dogs on the herding team. * Jake: Named after our dog Jake, but also after Jacob in the Old Testament, who fell asleep with a rock for a pillow and dreamed he saw angels ascending and descending where he slept. He is the one who said “Surely the Lord is in this place, and I did not know it.” In our image Jake is the border collie who knows with certainty that the Lord is in this place. Therefore Jake acts with great confidence to herd the sheep back to the pen. He knows the Lord is with him, so he cannot fail. * Gabe: Named after the angel Gabriel, who told Mary, who taught her boy Jesus, who taught his disciples “Nothing is impossible with God.” Gabe is the border collie who can handle the toughest, most aggressive, most stubborn sheep and the belligerent rams because he knows nothing is impossible to accomplish when God is helping you. * Si: I had an uncle named Cy. The border collie Si is named for Silas, the traveling companion of the apostle Paul. Silas was with Paul when they were thrown into prison, into the innermost cell, and left in stocks in the darkness; yet they spent the night singing their thanks and praise to God. And they experienced an earthquake that set them free, and yet they refused to go to save the life of their Philippian jailer. Si is the border collie who knows that in the darkest, most dire situation God can still act to set people free and to bring goodness to many. * Zeke: Named for the Old Testament prophet Ezekiel, the prophet who in the story of the valley of dry bones was told by the Lord “Prophesy to the wind. Say to the wind ‘Come from the four corners and breathe upon these slain that they may live,’” and who saw the wind, the breath, the Spirit of God enter those slain so that they stood up a multitude of living and breathing people. Having this diagnosis has reminded me that we are all dying. In a sense we are all already slain, and yet we can live by the breath of God in us. * Abby: Named after King David’s wife Abigail, the only wife he ever should have had. Abigail was full of integrity, loyalty, wisdom and the desire to save life. She took decisive action in a crisis, action that saved lives and brought peace. The border collie Abby is the one to call for in a life-and-death crisis. She knows what to do. * Siggy: Our daughter Sara has a dog named Siggy. Siggy is not a border collie, and in this tumor shrinking visualization, she is also the only dog that is not a border collie. She is some kind of Australian sheep dog mix. Sara’s Siggy is very loving. She will lick you until you say “Siggy, stop!” Then she lea ns back into your chest and looks up at you with her soft eyes and sighs. She especially likes men. But she is also fiercely protective when she senses (or more accurately, imagines) danger toward those she loves. Siggy’s real, full name is Sigma. Sigma is the first Greek letter of the Greek word soteria meaning “salvation.” Soteria also means preservation, deliverance, safety, wholeness, health. The Australian sheep dog Siggy embodies Sara’s dog’s fierce love and protection, and all that salvation means to us. 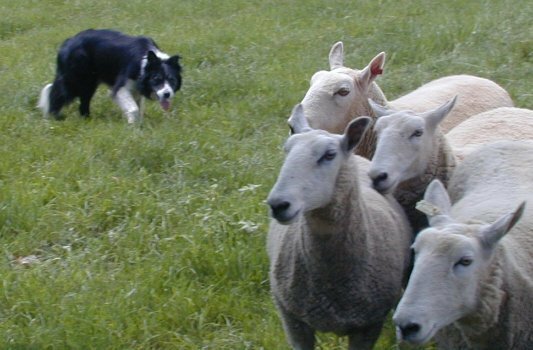 Jinny said to me one night during the first round of chemotherapy, “I hope the border collies are herding the sheep.” Without thinking-it just came out of my mouth-I said “The dogs will do what the shepherd tells them to do.” And that is our hope. We know we have a Good Shepherd, who walks with us through the darkest valley and keeps us safe. We know that the Lord is in this place; that nothing is impossible with God; that in the most desperate circumstance, God can set us free and help others in the process; that the breath of God can bring us health and life; that God is good in a crisis; and that God wants for us everything that the word “salvation” means in all its fullness. In the last few weeks we have been watching videos of border collies at work. They are amazing, as their herders are also amazing. 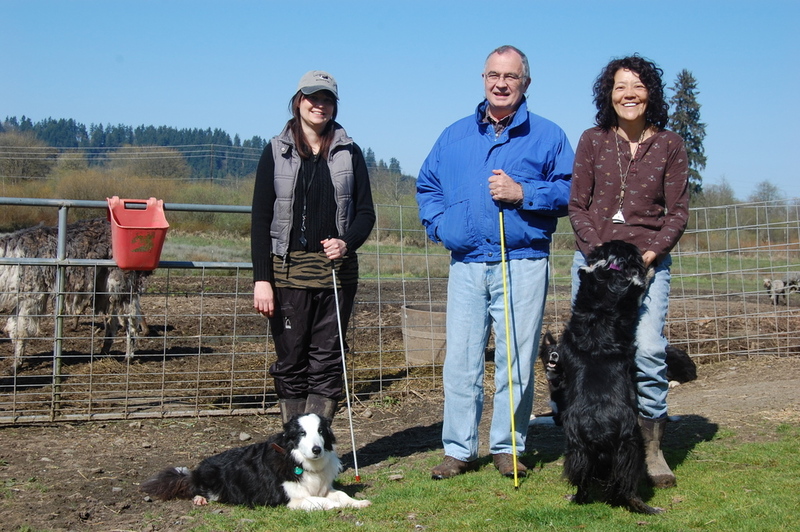 Last weekend we went to a farm in Carnation where a wonderful woman named Diane Pagel and her assistant Janet taught me a little about how to give the commands that border collies understand and respond to when herding sheep. I am not a good Shepherd by any means. And our visualization about border collies herding the sheep back into their pen and shrinking my tumor does not depend upon my ability to give the right commands. It depends upon the good Shepherd and commands he gives that affect this tumor. As you think about us and pray for us, we invite you sometimes to visualize this team of herding dogs who will always do what the shepherd tells them to do. And ask the shepherd on our behalf to re-gather the sheep into their proper pen and lay his healing hands upon them. WATCH Border Collies at work! These are two YouTube videos I especially like — though I turn the sound down when watching them! I nearly giggled. What joy. Suddenly I noticed that the sun was out, and that there were incredible views of the Alps. Two hundred yards into Switzerland, I pulled over to the side of a road. We were beside a meadow, where goats (OK, goats, not sheep) were grazing. They wore bells on their necks, and it made a lovely tinkling sound as they variously bowed their heads to take another munch at the grass. Then I noticed the shepherd and her dogs. They were sitting on a slight rise in the meadow. The dogs kept their eyes on the goats while she read a book in the sun. I have a picture of Joe from that moment, with the mountains in the background and a big smile on his face. My prayer is that you may read a book in the sun while the shepherd watches over you. My prayer is that the dogs will keep their eyes on the goats/sheep, and keep them in their proper place. My prayer is that you might be free of the fear and anxiety I faced as we approached the border, and that you might experience moments of bliss comparable to that I experienced after being allowed into a place that I did not expect to get to go. What a great visualization! 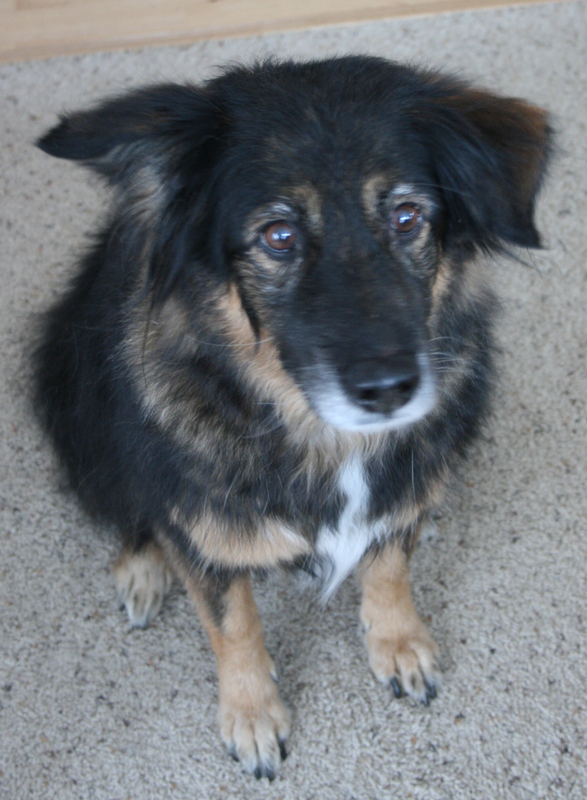 Our border collie mix, Juno, would very much like to join your team. I’ll send you her picture! I’ve wanted to commend you for doing this blog since I first began reading all of the family posts. You are so honest and real in all of your emotions. You are certain to help many other people facing difficulties. I remember your Jake from my visit and stay with you. I also remember him as my first ‘rinse and hold’ cycle dog. I love that DOG is GOD in reverse. I am praying Jake and all the other dogs on Mother Earth and in Heaven are rounding up ‘the sheepish cancer cells’. I’m also thinking of an Oscar winning movie I watched years ago titled “BABE”. If you’ve never seen it or it’s been a long time, you might want to watch it with the family and even with Evan. I know from your sister, Jill, my BFF, there was a pet pig in your family. Your family pig may just be helping all those border collies round up the sheepish cancer cells as well. I know I will be praying they’re all rounded up and healed by God’s healing hand. Much love to you all. You are all in my thoughts and prayers daily. Thanks to you and your daughters for sharing your thoughts and feelings with us in this very challenging time in your lives. I’ve read all of them so far and will continue to do so. We had a Border collie when I was a teenager. Unfortunately, he didn’t get to be a herder, just a beloved pet, tho when we visited my folks with our small children, he would stand between me and the children as tho keeping me safe from these little ” intruders,” upsetting the children, of course. Your openness and honesty is very refreshing and a model for others in a similar boat. You all have been and will continue in my thought and prayer, including the congregation of MIPC. Growing up on a sheep ranch in Montana with dogs just like you’ve described is a wonderful and easy visualization for me as I pray for the chemo to not only heard the bad cells into the pen but to keep them there! Go Jake, Gabe, Si, Zeke, Abby and Siggy! Jesus, the great Sheppard, knows all the right commands. 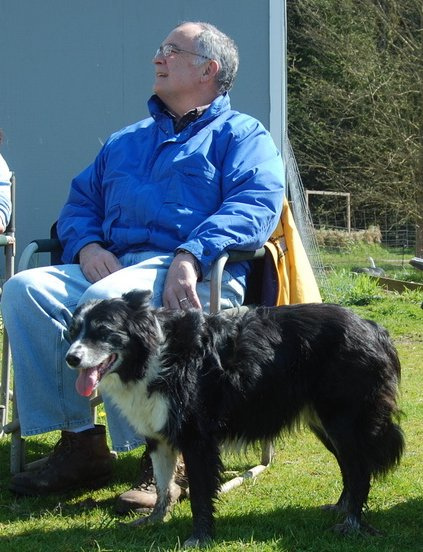 Dale, while taken off guard by your diagnosis, I am fully in concert with your ‘all things are possible in God’ outlook and totally engaged by your team of border collies. I have a mix, Pickles, who will be wearing an extra tag with your name on it. I send you, jinny and all your family sunshine from the south, and we will pray mightily for you at palm springs Pres. Blessings, always.